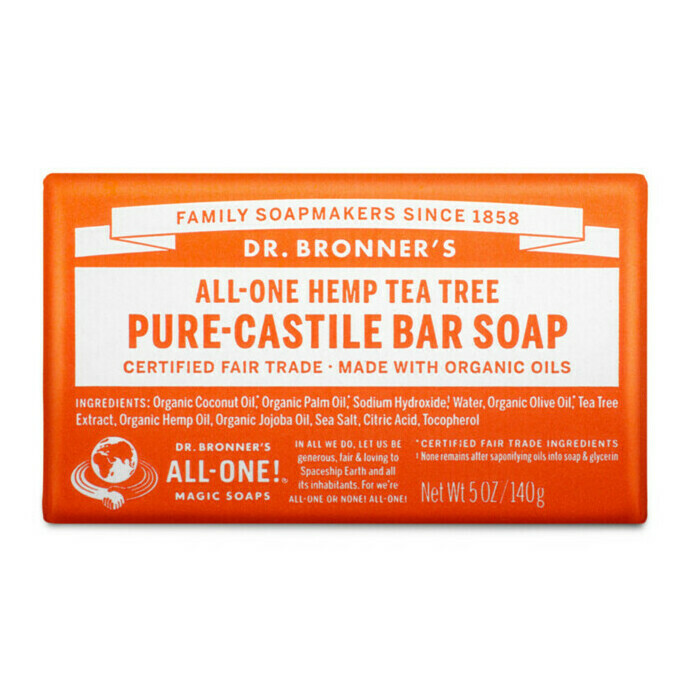 Dr Bronner's Pure-Castile Bar Soap in Tea Tree works into a frothy lather that not only provides a deep clean, but also helps to combat acne. 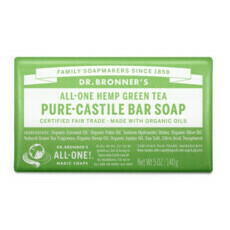 Made with Hemp Oil, Coconut oil and Tea Tree Extract, the soap doesn't dry or irritate your skin. It can be used all over the body, including the hair, where it can help improve dandruff, and is suitable for the whole family. Dr Bronner's 100% Pure Castile soaps are made using vegan and cruelty free production processes. Since 1858, these soaps have been produced organically and sustainably, without harming rainforests or wildlife at any point in the supply chain. Use to clean your entire body including your face, hands and hair. Dr Bronner's Pure Castile soap bars are a staple in our household. Gentle on the skin whilst leaving you feeling fresh & clean. Sandalwood is my all time favourite bar closely followed by the green tea. I have mature skin, dermatitis & very sensitive skin. I use this on my face and have found it is great at preventing pimples due to its antibacterial properties. Lasts ages too!